One of the benefits of being a silent movie fan is that you never know when a film you’ve seen before will be reinvented. This is not to say that movies of this era were more malleable somehow—they were treated like crap, for the most part. Abused, cut up, re-edited (sometimes for sound), pirated, poorly stored and left to rot. This makes a whole print pretty hard to come by, but footage thought lost forever often pops up again. This puts anyone’s claims of a ‘definitive’ edition under serious strain. For example, poor Kino International, which put out a gorgeously restored edition of Metropolis (1927) only a few years ago, could soon see that edition rendered obsolete, as a substantial amount of new footage was discovered last year in Buenos Aires, of all places, and from it a new longest-cut-ever may be created. If so, it will replace Kino’s print as the definitive Metropolis, until someone pries open a garbage can in an abandoned asylum in Bucharest and finds another reel. Watching silent films, then, has an element of the treasure hunt in it. And occasionally, the results are to be treasured. So it was for me last night, as I got an opportunity to see—live—the 107-minute version of The Phantom of the Opera; a print about 30% longer than any I’d seen before. This print, rarely seen, and in spots poorly maintained, nevertheless contains a spectacular full colour version of the Masquerade, in which the Phantom (Lon Chaney) appears in skull mask and brilliant scarlet robes. The effect is extraordinary, and worth the price of admission on its own. When I say ‘full colour,’ I don’t mean tinted (a process by which the film is bathed in a solution that colours everything on-screen) or even hand-painted, as some films had been, cel by cel, since the very beginning. These processes can yield beautiful results, yes, but in this case, we’re talking about something nearly as dazzling and precise as the Technicolor wonder-pics of the 1930s onward. The Phantom, in all his array, is here brought to life through the mysterious Handschiegel colouring process. The rest of the film, sadly, ranges from passable to YouTube-quality black-and-white, but you take what you can get with these things. And anyway, there was more: I got to watch this print accompanied by Dr. Philip Carli’s impressive Wurlitzer organ playing. Confession: I’ve never been fond of the Wurlitzer sound, though it’s a part of many, many home video releases of silent films. Heard live, it was a different matter. As Carli explained to me during the intermission (playing that thing’s a LOT of work), a Wurlitzer’s range is so great that recording mediums can rarely capture it. I’d add that the feeling of the organ—that is, the powerful vibration of its low notes—adds something no home theatre can recreate. It is most potent during the intense sequences of a horror film like The Phantom of the Opera. Among other things, Carli’s performance reminded me that screening silent films, unlike sound pictures, was a collaborative effort. This element is lost in the age of DVD, though some high-end distributors, such as Criterion, have recaptured its spirit through their willingness to provide several scores to their DVD releases. Different music means different interpretations, and a great piece of art is always open to reinterpretation. Ah, but what of the film? The Phantom of the Opera is pretty much what you’d expect—a fun, somewhat over-the-top horror/melodrama, made memorable by its always-memorable star, the ‘man of a thousand faces,’ Lon Chaney. His Phantom begins as a glanced shadow, described in whispers and gasps by the cast and crew of the Paris Opera (Palais Garnier). This gaggle of labourers and ballerinas, including Keaton favourite, Snitz Edwards, provide some early comedy. Things turn grim, though, when up-and-coming diva Christine Daae (Mary Philbin) and her would-be suitor, Raoul (Norman Kerry) run afoul of the Phantom’s designs. It will surprise no one who’s seen this film, or its 1943 remake with Claude Rains, or Robert Englund’s Freddy Krueger-esque 1989 remake, or the Lloyd Webber musical, or it’s 2005 film remake, that the Phantom loves Christine, and is guiding her career with the ultimate purpose of possessing her. Chaney’s version, the first to adapt Gaston Leroux’s 1910 novel, really gets that part right. After Christine is drugged and taken to the deepest bowels of the opera house, she awakens to find herself in an over-upholstered fantasy boudoir, complete with a hanging canopy of satin over her bed. On a nearby chair hangs a gown—suitably dramatic—which the Phantom expects her to wear. She’s pretty freaked out. Philbin and Kerry are, as Carli said in his introduction, ‘rather limp.’ But I’ve never seen a version of ‘Phantom’ in which their characters weren’t. Christine and Raoul are thankless roles, because they represent shallow, beautiful people propped up by a patron in one case, and family money in the other. The Phantom is more brilliant, more enigmatic, and despite his cruelty, far more sympathetic. Chaney’s theatrical portrayal of the man—all hand gestures and dramatic pauses—takes nothing away from his pathos. First, it’s appropriate, because here is a man removed from society, but obsessed with opera, the most overwrought of performance arts. 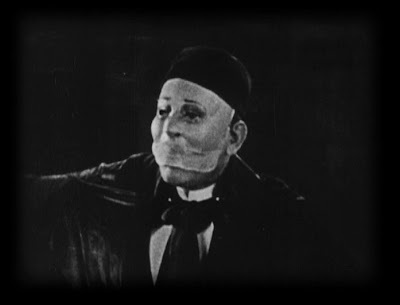 Second, it’s necessary, because Chaney has to spend much of the film with his face covered. The mask in this film is not a chic fashion accessory, like the musical’s version—it covers two-thirds of the Phantom’s face, and is sculpted to give him a benign, and almost banal expression. So much the better when stupid Christine pulls that mask off and reveals Chaney’s horrific face for the first time. That scene, one of silent’s cinema’s best remembered, still works. Especially when you’ve got organ pipes blasting behind you. In the end though, it’s those colour scenes that stay with me. Imagine a silent film, acted in the arch style of mid-20s melodrama, but in full colour. There was such dissonance in that for me, as though I were peering through time to see these actors as they ‘actually’ looked on set. The moments seemed to pulse. 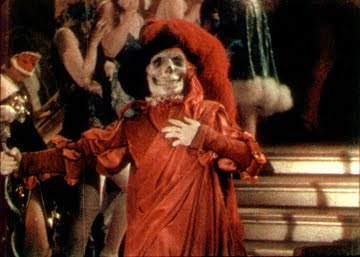 The Phantom of the Opera doesn’t ‘need’ this colour to be a good film, but the addition of it, like the addition of the live organ, made it a whole new viewing experience. Once again, the old is new, and endless in its variations. 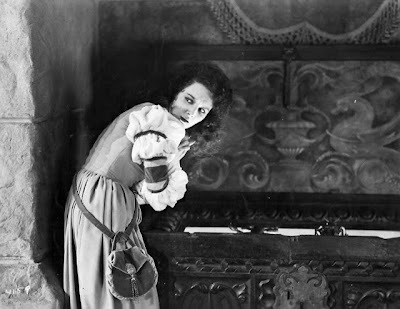 Mary Philbin also appeared in The Man Who Laughs (1928), featured elsewhere on this blog. The Wurlitzer organ is a permanent fixture at Casa Loma, one of Toronto’s major tourist attractions. To learn more about Casa Loma, click here. And finally, thanks to Caren Feldman and the Toronto Film Society (TFS) for alerting me to this performance. If there had been Academy Awards in 1925, the Phantom's red cape should have been nominated for "best supporting", for that scene on top of the Opera House. Lucky you getting to see "Phantom" as it was meant to be seen, on a big screen with theater organ accompaniment!! Since you saw a version that runs 107 minutes, I'm wondering if you maybe actually got to see the REAL 1925 version (which had been thought lost) instead of the inferior, chopped-up 1929 version. If so, even better!! The restored film quality of the 1929 version is better, but the story flows with much better cohesion in the 1925 version. Incidentally, that well-known particular unmasking stillshot above is NOT from the 1925 version. 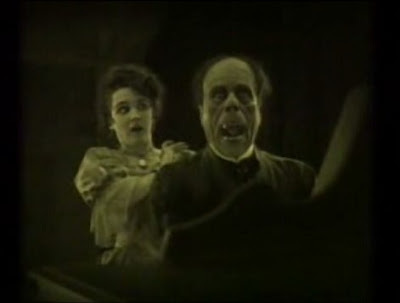 Lon Chaney himself rejected that scene for the original because it was actually lit for color film and the increased (and hotter) lighting made his makeup unstable. Look closely and you can see where the headpiece is separating from his face. The 1925 version looks much better and scarier since it was lit for black & white film, which is what Chaney designed it for to begin with. The "geniuses" at Universal didn't want to chop up the true B&W 1925 version (like they hadn't horribly botched it up already), so in 1929 they used the color scene Chaney rejected and just made it B&W instead. 2) The beautiful and eerie, atmospheric set designs. I'm not sure which cut this was--I recall mention, at the time, of it being a shorter version, but also the version with better picture quality.